Jane and I were walking back to our hotel after visiting an Anchorage, Alaska, Little Free Library. 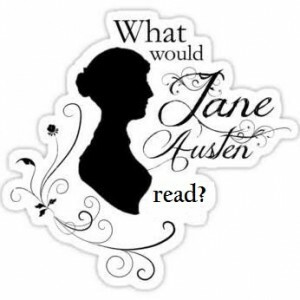 Well, I was walking; Action Figure Jane Austen rode in the comfort of the side pocket of my purse (though she insisted on calling it a reticule). As Jane peered out at our surroundings, she found Anchorage surprisingly civilized, in contrast to the rustic, frozen wilderness she had expected. We had no other Little Free Libraries to visit that day, but I was hoping to find a particular spot I remembered from a previous (Jane-less) visit to Anchorage. I did not know the address, but I was pretty sure it was only a few blocks' detour from our walking route to the hotel. While exploring Anchorage years earlier, my husband and I had chanced upon a fenced yard with an actual, live caribou inside, identified by a sign as Star the Reindeer. I wasn't sure if Star still lived there. But my recollections were accurate, and my sense of direction did not fail me. Much more easily than I expected, I found Star's pen at the corner of 10th Avenue and I Street. And imagine my surprise when I saw a new addition to Star's home: Star may be the only reindeer ever who has his own Little Free Library! It's an attractive wooden library in woodsy shades of forest green and maroon, with a little white picket fence and a reindeer on the side. In her own lifetime, Jane may have had opportunities to see exotic wild animals, but probably not a reindeer. Menageries were quite the fashion in her time; she even mentions one in Sense & Sensibility. And while I felt sorry for Star, living alone in a pen instead of roaming free on the tundra with the rest of the caribou, Jane remarked that his pen was quite spacious, compared to the cages at the Royal Menagerie in 19th-century London (which apparently did not have a reindeer). I have since learned that Star's owner regularly takes him on walks around Anchorage, where he (Star, not the owner) is known for being friendly and gentle with the locals, who consider him to be something of a city mascot. In Jane's time, visitors could bring a small dog or cat to feed to the lions at the Royal Menagerie, in lieu of the admission price. In modern-day Anchorage, no payment is required to see Star, though he might have enjoyed having a dog or cat -- for companionship, not dinner. The Little Free Library did not have an official sign, so it is apparently unregistered, but we don't discriminate. Jane and I left a copy of the Jane Austen Book Club, by Karen Joy Fowler, in hopes that Star will find it an entertaining distraction. As for what to read, Jane was intrigued by My Beloved World, an autobiography by Supreme Court Justice Sonia Sotomayor. Women were not allowed to be judges in Jane's world, and while she finds some modern innovations disturbing, she thinks this one is long overdue. Speaking of innovations, on the walk back to the hotel, we spotted a drone flying overhead. The drone obviously spotted us, too, and began following us home, tipping itself repeatedly as if to wave hello. Jane found it disturbing at first, but after I explained what it was, she became intrigued. She wondered how Mr. Darcy might have used such a drone to more quickly locate Elizabeth's sister Lydia, after Lydia ran off with that rogue, Mr. Wickham. Perhaps Action Figure Jane will write a modern update. The photo at right is the only known photograph ever taken of Jane Austen in the company of a live caribou.